The RBI Assistant Prelims Exam is happening today too and we have with us the review of the RBI Assistant Slot 1 of today. The exam was easy in the first slot too. There were small differences in the topics asked in the 1st slot of the RBI Assistant Prelims Exam 2017 happened too. 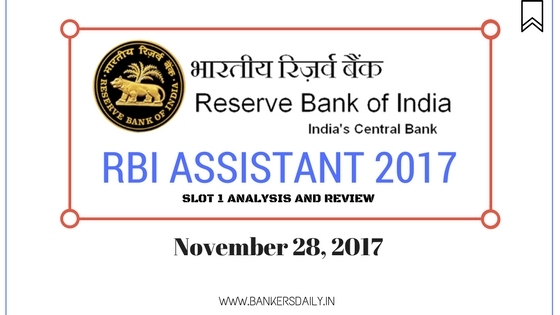 We have already posted the review of the RBI Assistant which happened yesterday and there are totally 4 slots. 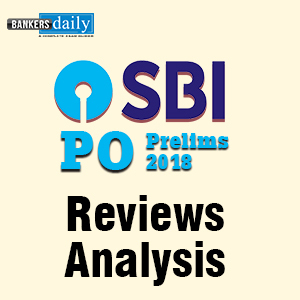 You can check the review of the RBI Assistant Preliminary Examination 2017 of 27th November 2017 from the links given below. The Quantitative Aptitude section is unchanged and there weren’t much changes in this section. A tabular DI was asked and it involved questions from percentages , ratio , averages, etc. The Number series was in the easier side. A floor based Puzzle was asked this time involving one variable. The Linear Seating Arrangement was asked which involved persons facing north and south , involving 6 persons. Syllogism and Coding & Decoding topics were asked in the section. No New pattern questions were asked in the Reasoning section of the SLOT 1 of RBI Assistant Exam. The Reading Comprehension is easy and all the other topics were unchanged like the last slot for yesterday. Phase Replacement was this time and that too was easier. Major questions were from Error Spotting and Reading Comprehension. This time this we can expect many aspirants to score good marks in the English section which is always in the tougher level.